Man Thought To Be Horse Thief Killed by Train. The mystery which surrounded the sensational death of an uaknown man under the wheels of a Big- Four train near Lawrence, Ind., gMonday afternoon, was cleared yesterday when the mangled body was identified as that of Samuel Nortbcott, an escaped inmate of the Julietta Hospital for the Incurable insane. Search for Northcott had been made since Sunday night, when he escaped, apparently, by forcing" aside the screen over the window of his room in the asylum. His door was locked, and his absence was not dis covered until Monday morning. It is declared by members of the Horse Thief Detective Association of Fortville, that the man killed had been chased from the farm house of William Snyder, near Mohawk, after he had stolen a horse. It is said that when about to be overtaken by his pursuer* the thief threw himself before the train. According to the story told by the engineer, and fireman on the train, the man fell in a fit while walking on the tracks. The accident was reported by wire from the next station east at which the train stopped. The body was taken to Oaklandon. "The story that Northcott stole a horse near Mohawk does not seem to be improbable," said Superintendent Morgan last night. "However, he would not have been responsible. He was incurably insane, and has frequently given the institution trouble by running away. A few weeks ago Nortdcott escaped from the asylum at Julietta and after terrorizing the residents of Tuxedo Park for several hours by strange antics, was captured in a tree-top by the police. 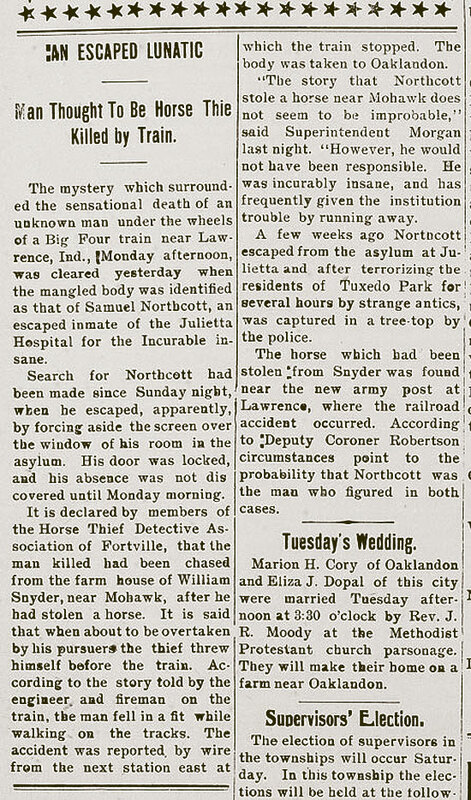 The horse which had been stolen "from Snyder was found near the new army post at Lawrence, where the railroad accident occurred. According to 'Deputy Coroner Robertson circumstances point to the probability that Northcott was the man who figured in both cases. Marion H. Cory of Oaklandon and Eliza J. Dopal of this city were married Tuesday afternoon at 3:30 o'clock by Rev. J. R. Moody at the Methodist Protestant church parsonage. They will make their home on a farm near Oaklandon.